The attack came as a surprise on a Sunday night around 01:00 AM and lasted for approximately one hour. Fortunately this is well outside of our business hours, so it had no real impact. However, it did not stop there. There was another instance around Sunday noon that only lasted for 10 minutes. On Monday, another short flood took place in the evening that I could experience live. 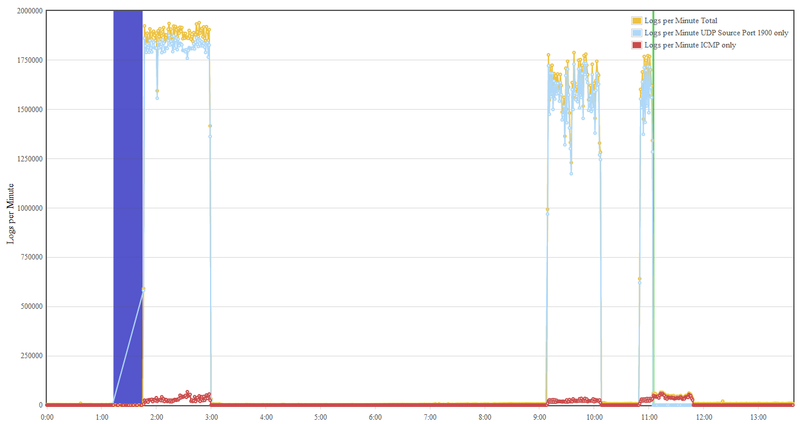 Our Check Point Firewall showed a huge spike in the number of packets on the external interface. Normally we see about 130 logged connections per second during business hours, but here we have 36,000 per second. I managed to grab a few sample packets during one of the attack windows. The packet’s destination IP was that of an web server of ours, which hosts our most popular site. The destination port was UDP/80 with the source port UDP/1900, meaning the attacker sent a query with source port 80 to the SSDP devices and they responded accordingly. I should emphasize that this statistic is based on logged connection objects from the firewalls point of view, and not on raw IP packets. Multiple packets with same same source/destination IP and port within the UDP session timeout are counted as a single dropped connection, and usually multiple packets were sent from one source at the same time as I could confirm with packet traces. When I checked the active firewall interfaces during the live attack, I saw 200,000-350,000 packets per second on the external interface. For comparison, we usually have 50,000-60,000 during peak hours. The flood of packets also caused a huge number of interface RX drops (netstat -ni, NIC driver RX ring buffers overflowing), packets which were probably not even included in the total packet rate. As an interesting side note and as you can see in the above graph, the number of ICMP packets also jumped up considerably. These come from ICMP Port Unreachable packets that are generated by systems the attacker sends a spoofed UDP/1900 SSDP packet to, when the system actually does not have a service enabled on this port. 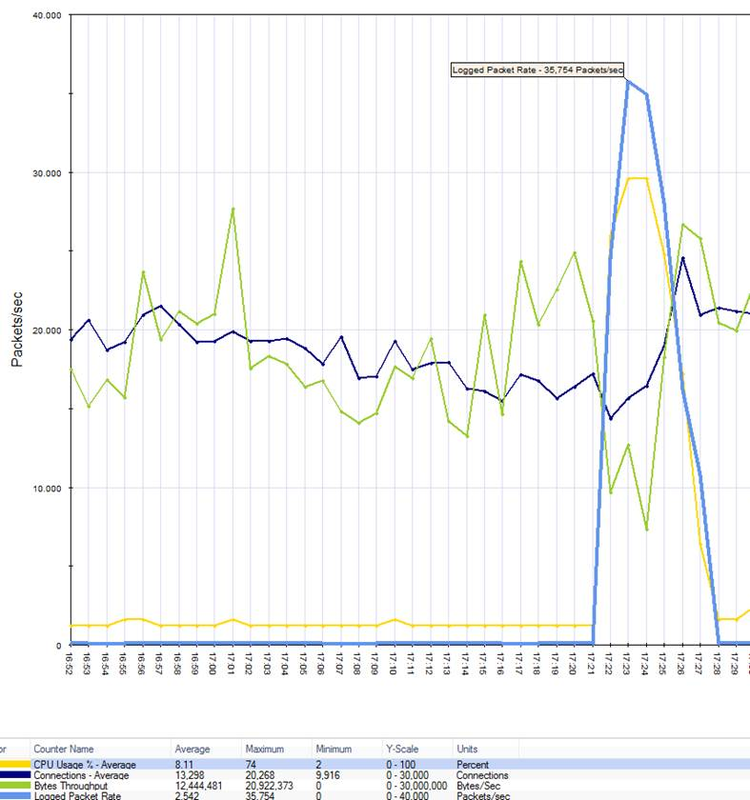 The attack caused our firewalls to log locally instead of sending the logs to the centralized management, even having to delete older log files to cope with the steady rate of new logs (blue bar). On this Wednesday in total we had a total of 263 million firewall log entries, of which 247 million were UDP/1900 SSDP and 6 million were ICMP traffic. This does not include the data from the deleted log files, which should ramp up the numbers by at least another 25%. From analyzing the logs in more details I found out that on this day, a total of 3.7 million unique IP addresses were abused in this DDoS attack. That’s quite something. Of these IPs, 3.2 million had at least 10 SSDP log entries, 800,000 had at least 100, and only 42 IPs had at least 1000 log entries. This does not include IPs that only responded with ICMP port unreachable messages. As mentioned earlier the packets were destined for port UDP/80 to our web server. As we do obviously only allow TCP/80 for normal HTTP to our web servers, the packets were dropped right at our Check Point internet firewall (R77.20 for the record). The SSDP packets generated a good amount of traffic with approximately 300-600 Mbit/s, but not enough to completely fill our 1Gbit/s uplink (which even during peak hours is only utilized to about 40%). 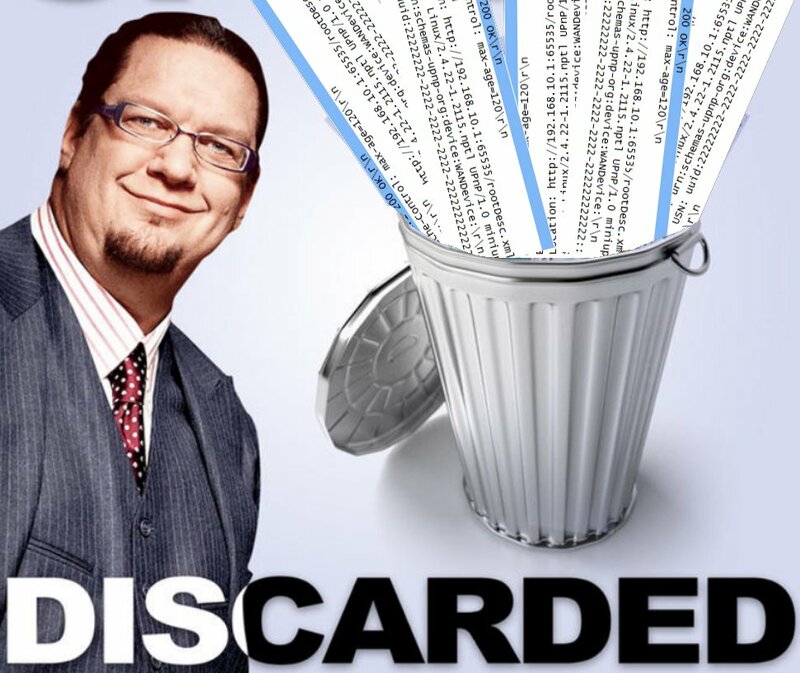 The firewall however was under heavy load and mainly busy discarding the SSDP junk that was being thrown at it, causing legitimate connections to be slow or arbitrarily failing. Connectivity to the internet was fortunately not completely down but moderately slow/unstable. It was clear some kind of action was needed. Unfortunately this didn’t help much in our case. When the attacks came up on Wednesday again, I saw that packets were being dropped by SecureXL drop templates (fwaccel stats -d), but the load didn’t change much. It seems like only a fraction of the packets were dropped on the accelerated SecureXL layer. I assume the generic optimized drop feature that dynamically creates drop templates wasn’t very effective because of the large amount of source IPs participating in this DDoS attack. Next up I activated a SecureXL accelerated drop rule to handle the traffic, and this did the trick. The CPU utilization immediately declined to acceptable levels and connectivity became stable again. Meanwhile I could see that the attack was still ongoing with cpview showing that all of the traffic was dropped on the SecureXL layer. In the earlier graph up above the activation of the accelerated drop rule is indicated by the green bar. As you can see, no more UDP/1900 packets were logged, as we did not enable logging for these packets, but the ICMP log amount shows that the attack continued unsuccessfully for almost an our until it finally subsided. The rule is active immediately and works well, I haven’t noticed any negative impact. I could have included a destination directive as well but we don’t have any such legitimate traffic at all and I wanted to keep it simple, also for the sake of not having to bother a busy firewall with matching the packet’s destination IP. Keep in mind that you should configure these rules on passive cluster members as well, so they can make use of it once they becomes active and that these rules don’t survive a reboot, so put the command in a startup script (/etc/rc.d/rc.local) as described in the SK article. As a general performance optimization, I later also increased the RX ring size buffer on the Check Point Firewall NICs from the default 256 to 1024. This helps with driver RX drops and a decreases the softIRQ burden on the CPU during high packet rate situations. SSDP is a protocol that few admins know about, and probably even less suspect it of being used in a DDoS attack. Expect it to be used more frequently for DDoS attacks. Check Point already provides a number of basic, but effective out of the box features you can use to protect against some DDoS threats without having to buy additional licenses/software blades or dedicated DDoS protector appliances. – Penalty Box – This can be especially useful when dealing with zombies that each send large amounts of traffic (only if it is dropped/triggers IPS). These and other general performance optimizations especially in relation to DDoS attacks are also described in this Check Point whitepaper. The characteristic of this DDoS was that it employed a huge number of 3.7 million victim IPs to amplify the attack, but most of these IPs were only abused for a relatively small number of requests each. We have no idea who was behind this or why. As they sent spoofed packets to the SSDP-enabled devices, even they can’t tell the actual attacker source. There are other odd things like how the attack was launched sporadically and never lasted very long, how attacks were launched at hours accomplishing pretty much no damage. Whatever was the attackers goal, he wasn’t very determined about it. Besides I see absolutely no point in targeting a the web site of a non-profit and unpolitical organization such as ours. Too many ISPs around the world still haven’t implemented BCP 38, Network Ingress Filtering to prevent IP-spoofing from their networks. Without being able to spoof the victim IP address, such reflection/amplification attacks using DNS, NTP, SSDP or other connectionless (UDP-based) protocols would be impossible. This entry was posted in checkpoint, firewall, networking, security. Bookmark the permalink.